It's a cinch to make string quilts. These easy quilts are assembled using a simple type of foundation piecing. You'll also hear the method referred to as string piecing and string quilting. String piecing is a free-form quilt making method, so you do not need to mark a pattern onto foundations. Instead, you'll simply position strips, sew a seam, flip the strip right side up, and then add another. It's rather simple, but there are so many ways to string piece that the results are never boring. String quilts are named for the strips of fabric that are used to make a quilt: the strings. The strings are sewn to a permanent foundation, such as muslin. You can use another fabric for the foundation if you like, or a thinner material, and even prints, but choose something that won't show through the strings after the blocks are assembled. Tip: If you sew strings to a printed fabric, flip it over and sew on the reverse side, which is usually more subtle and less likely to be visible in the finished quilt. String quilts likely originated as a make-do technique created by budget-conscious quilters because the method is a perfect way to use leftover scraps of fabric. 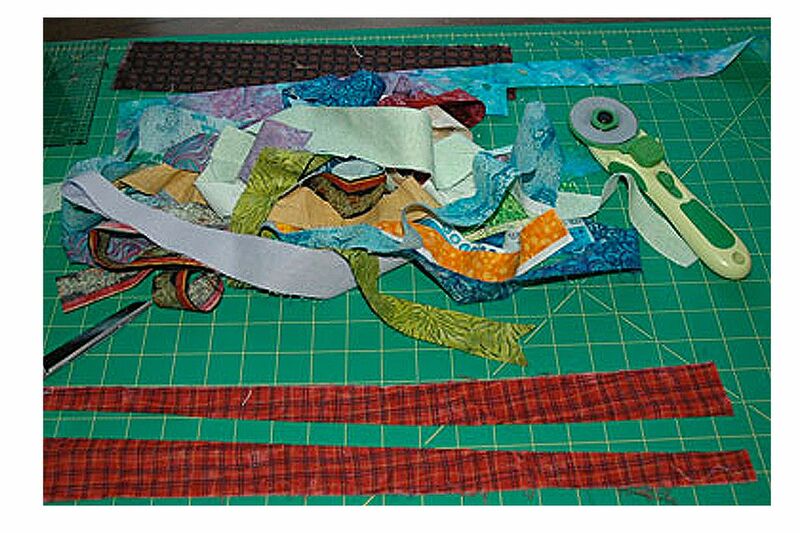 The technique is still a great way to use quilting scraps, but today's quilters often purchase fabrics just so they can cut them into strings. Strings needn't be straight strips of fabric; cut some with angled edges to create variety. Don't worry about fabric grain placement, because the strings are permanently stabilized by the foundation. Forget about trying to match fabrics. String quilts are charming when assembled from a wide assortment of colors and fabric styles. Choose quilting fabrics in many color values. Strings can be any width, and for the most interesting results, their widths should differ. Try cutting strips that are 1 1/4" to 2 1/2" wide for 8" or larger blocks. Cut narrower widths for smaller blocks and miniatures. String quilted postcards are a treat. See lots of string quilt possibilities. The Wonky Log Cabins quilt block pattern is a string quilting project. It's easy to create a string table runner. Use muslin as a foundation or any pre-washed cotton fabric you have on hand. Some quilters save worn out sheets to make their foundations. You can also use interfacing or another similar material that will remain in the quilt. Medium gray or beige cotton thread blends well with nearly any fabric. Give one of those colors a try when you make a string quilt. Choose a finished size and add 1" to its length and width — that's 1/2" more than we use for a traditional quilting seam allowance. String quilt blocks often become distorted a bit as you add strips of fabric, so using a larger than necessary foundation gives you the opportunity to square the blocks up to the perfect size after assembly. Cut a 9" x 9" fabric square. Choose a string that's long enough to cover the foundation when positioned diagonally, from one corner to another. Place it slightly off-center along the diagonal, right side up. Secure the string with straight pins or simply hold it in place. Place another string on top of it, right side down, aligning one of its edges with either edge of the first string. The ends of the second string must stretch past the edges of your block because, when it's sewn and flipped right side up, it will lose a bit of length on each end. Sew the strings together along the aligned edge. Press to set the seam — a step that's easy when you are chain piecing many quilt blocks. Flip string 2 right side up and press. Turn the block over and trim long tails close to the foundation. You can wait to trim, but trimming now helps you see where the foundation ends. You have a little extra block size to play with, so don't panic if the second string is slightly short of the edge when flipped into place. Add another string to the block, aligning its edge right side down along the unsewn edge of the first string. Sew with a 1/4" seam allowance, but don't stress if the allowance is a bit wider. Flip the second string right side up and press. Turn the block over and trim long tails back a bit, leaving a little fabric extending past the edge of the foundation. Continue adding strings to the block. If you aren't chain piecing, do consider sewing two strings to the foundation before getting up to press and trim, working from the center outwards as explained. You might find it helpful to set up a small, portable pressing area next to your sewing machine. If you don't like the bulk of a large iron, try a mini iron instead. It's okay if your strips are all straight and you don't want to take ​the time to trim them into wedges. The photo illustrates strings that are nearing one corner of the quilt block. You can position a string at an angle when you sew it to the block. Trim the seam allowance slightly before flipping the new string right side up, and then move on to the next string. Turn your completed string block over so that the foundation is visible. Use a square ruler to trim it back to 8 1/2" x 8 1/2". Create an 8 1/2" template and trace around it if you do not use rotary cutting tools. You might find that your next starter foundation does not have to be a full 1" taller and wider than your finished block size. If that's true, cut your next foundation slightly smaller. Sew strings horizontally onto the foundation instead of at an angle. String piece onto long strips of fabric, and then use those strips to cut squares, rectangles, diamonds or any other shapes you need for your quilts. String piece large blocks and cut them into smaller squares or triangles to replace plain fabric shapes in any quilt. Make a free-form, log cabin block from random strings. These blocks are a little wonky but absolutely charming! To make a diamond string-pieced design, cut the original string-pieced block into four equal squares. Rearrange the squares in a different configuration and sew them together. Choose another orientation for the small squares for a completely different look. If you use this technique, be sure to allow for the extra seam allowances in the smaller squares. Your trimmed parent square should be 1" taller and wider than the finished size of the reassembled block. For instance, to make a diamond block finish at 8" square, string piece on 9 1/2" muslin squares, then trim back to 9". Cut four 4 1/2" squares from the parent. This block is created from one string-pieced square, so the fabrics are repeated in the smaller blocks. For a very scrappy string quilt, make lots of different blocks, cut them apart and sew the small units together, scattering blocks with like fabrics across the surface of the quilt. String quilts are often made without quilt batting. If you choose to sandwich batting between your quilt top and backing, choose a low loft (thin) version. You'll find it's difficult to hand quilt through all the layers of a string quilt, so plan to machine quilt or tie your finished project.